To Cite: Bagherifard A, Jabalameli M, Ali Hadi H, Rahbar M, Jahansouz A, et al. 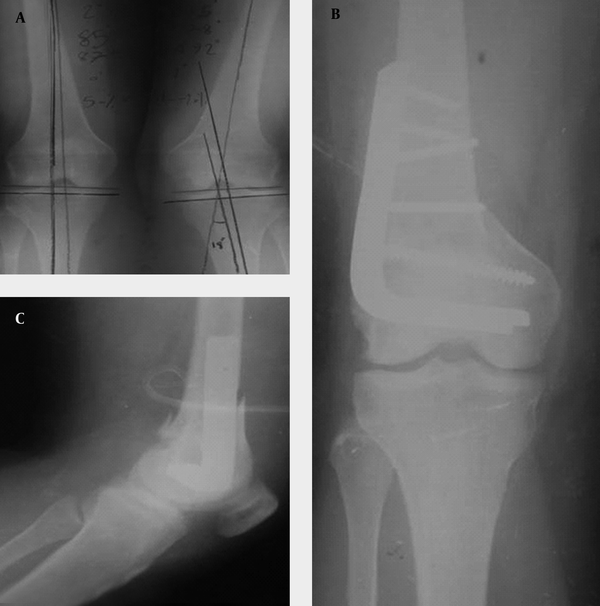 Lateral Distal Femoral Biplanar Open Wedge Osteotomy in Correcting Genu Valgum: A Case Series Report, Shafa Ortho J. 2014 ; 1(4):24626. doi: 10.5812/soj.24626. Background: Genu valgum deformity is defined as a mechanical axis deviation (MAD) lateral to the knee joint center. In this situation the lateral compartment of the knee is overloaded. Corrective osteotomies are recommended to realign the lower extremity. Objectives: This study was designed to evaluate the lateral distal femoral biplanar open wedge corrective osteotomy results in patients with genu valgum. Patients and Methods: This is a case-series study on seven patients. All patients had genu valgum deformity and medial thrust or pain in the lateral compartment. Lateral biplanar distal femoral open wedge osteotomy was used as corrective osteotomy. Radiological findings and union time at the osteotomy site of the operated patients was determined. Results: All patients were female. The mean age was 25.14 ± 4.74. The mean follow up time for these patients was 8.28 ± 6.96 months. The mean preoperative mechanical alignment was 8.71 ± 2.21 while the post-operative was 1.42 ± 0.53. The mean wedge size used for osteotomy was 8.71 ± 2.21 mm. The mean union time was 9.71 ± 2.56 weeks. Conclusions: Stability and early union without using bone graft at the osteotomy site, rapid rehabilitation and weight bearing of patients with genu valgum are the advantages of biplanar lateral distal femoral open wedge osteotomy. Copyright © 2014, Iran University of Medical Sciences. This is an open-access article distributed under the terms of the Creative Commons Attribution-NonCommercial 4.0 International License (http://creativecommons.org/licenses/by-nc/4.0/) which permits copy and redistribute the material just in noncommercial usages, provided the original work is properly cited. Lower extremity mechanical axis is drawn from center of femoral head to the midpoint of the talus dome. This line should normally pass through the center of the knee joint (1). Mechanical axis deviation medial and lateral to the center of the knee joint results in genu-varum and genu-valgum deformity, respectively (2, 3). Femorotibial angle of more than 12 degrees can’t be corrected by tibial varus osteotomies (4). Genu-valgum can be approached by uniplanar or biplanar methods including lateral opening and medial closing wedge osteotomies (5-7). There are three usual corrective osteotomy techniques for genu-valgum; uniplanar medial closing, lateral opening wedge and dome shape osteotomies. Indications have been proposed for these osteotomies, yet there is no accepted universal method for each patient and it depends on the surgeon’s preference and patient’s condition. Generally, open wedge osteotomy especially in the femur needs a bone graft (7). Osteotomy site union and early weight bearing are important factors during the post-operative period rehabilitation process (1). This study was designed to evaluate lateral biplanar distal femoral corrective osteotomy results in patients with genu-valgum in regards to union time and the need for bone graft, which have not been addressed before. The study was approved by the ethics board of our institution. Inclusion criteria were lateral joint line tenderness, and medial thrust in association with radiographic findings of overload lateral compartment, including subchondral sclerosis or lateral joint space narrowing. All patients had preoperative MRI to rule out lateral meniscal injury. Standing alignment view was used to determine the correction angle and width of the opening wedge at the osteotomy site. In supine position we used the lateral approach of distal thigh to gain access to the distal femoral metaphyseal flare, which was the osteotomy site. According to the preoperative planning for correction angle and width of opening wedge, oblique osteotomy was done from posterior to anterior up to 3/4 of the width of the distal femur. The ascending limb of the biplanar osteotomy in the anterior cortex was extended proximally up to 2-5 centimeter in length (8) (Figure 1). The osteotomy site was distracted, according to the pre-operative plan to achieve the correction angle, with care to avoid disruption of the medial cortex. The osteotomy site was fixed with a 95 degrees blade plate without filling the distracted osteotomy site with bone graft (Figure 2). A commercial knee immobilizer was used as post-operative support. Knee range of motion was started at the end of the first week after osteotomy. Toe touch weight bearing was advised after two weeks. Radiography of osteotomy site was done immediately after the operation, and four, eight and 12 weeks after the surgery. Full weight bearing was initiated after complete callus formation in three out of four cortices in plain radiographs. Seven patients were enrolled in this study; all were females. The mean age of our patients was 25.14 ± 4.74. In four cases the right side and in three cases the left side was involved. 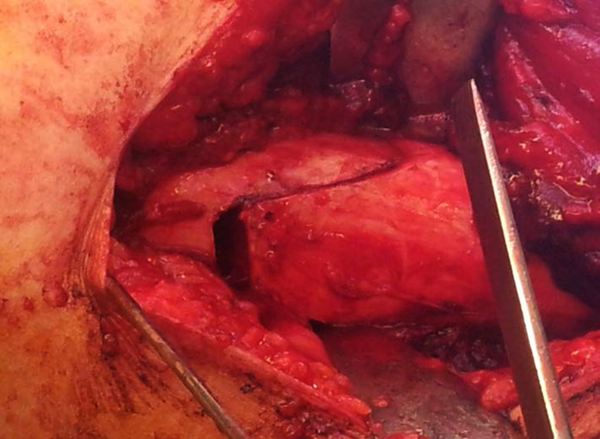 Biplanar osteotomy was done for all patients. The mean follow up period for these patients was 8.28 ± 6.96 months. The mean pre-operative mechanical alignment was 8.71 ± 2.21 degrees and the post-operative was 1.42 ± 0.53. The mean wedge size used for osteotomy was 8.14 ± 2.11 mm. The mean union time was 9.71 ± 2.56 weeks. The data of patients are summarized in Table 1.
aAbbreviations: F, Female; R, Right; L, Left; op, operation; SD, St. Deviation. Corrective osteotomy is used for different types of the knee joint malalignments. It is done either at the proximal part of the tibia or the distal part of the femur according to the location of the deformity and its severity (9). The majority of valgus knee deformities need femoral supracondylar osteotomy. There are three conventional methods of osteotomy in this area including, uniplanar lateral open wedge, uniplanar medial closed wedge and dome shape osteotomy. Uniplanar lateral open wedge osteotomy is more accurate than the medial closing wedge, which is commonly used for moderate to severe deformities and results in the lengthening of the lower limb (10). Using bone graft (autograft or allograft) to improve healing is the major disadvantage of the open wedge osteotomy. Medial close wedge osteotomy is associated with earlier recovery and more often is used for mild deformities. Limb shortening is one its disadvantage (10, 11). Biplanar upper tibia osteotomy is a well-defined procedure to correct knee joint malalignments and has been used for decades (11, 12). On the other hand this kind of osteotomy in the distal part of the femur is a new concept. Several advantages have been reported for biplanar distal femoral open wedge osteotomy; it can result in more rotational stability in the distal femoral osteotomy site especially when the medial cortex is not disrupted. Biplanar osteotomy does not need to use an auto or allograft and the morbidity of the donor site can be avoided in this manner. Furthermore, due to increasing of contact area, union and rehabilitation will be facilitated (12). This new technique of osteotomy was defined for the first time by Freiling et al., only for medial closing wedge of distal femur (14). They approached geno-valgum deformities from the medial side by biplanar medial closing wedge corrective osteotomy. They removed a mean wedge of 5-8 mm to close the wedge and fixed the osteotomy site by fixed angle devices such as double angle blade plate. Their study showed that early union and more stability at the osteotomy site are the advantages of biplanar medial distal femoral osteotomy (12). In our study we used lateral biplanar open wedge osteotomy instead of the medial biplanar closed wedge type, which is a new strategy and procedure. Brinkman et al. showed that the stability and rigidity of the osteotomy site with the bi-plane technique was higher than the single plane technique under axial loads (9). They reported rapid recovery of knee performance in patients with this type of osteotomy and showed increased weight bearing at the first week after surgery while bone healing signs in patients were observed after 6-8 weeks of this type of osteotomy (9). According to the study of van Heerwaarden et al. biplanar distal femoral osteotomy increases contact area and leads to faster healing and union at the site of the osteotomy (11). According to the studies of van Heerwaarden et al. (13) and Freiling et al. (14), there was no bone healing problems in patients with biplanar osteotomy. Limitations of this study are as follows: the small number of patients, retrospective nature of the study and lack of clinical outcomes. Further studies are recommended to evaluate the technique with more details and compare the results with other procedures especially medial biplanar close wedge osteotomy and uniplanar open wedge osteotomy of distal femur in regards to union time, stability and clinical outcomes. In conclusion biplanar lateral distal femoral osteotomy can result in union and rapid rehabilitation without using bone graft in patients with genu valgum. I would like to gratefully and sincerely thank Dr. Davood Jafari and all of the members of the operation room of Shafa Hospital for giving us the opportunity to complete this study. Also, we would like to thank Dr. Farid Najd Mazhar for his critical reading of the manuscript and for his insightful suggestions. Authors’ Contributions: Study concept and design: Abolfazl Bagherifard and Mahmoud Jabalameli. Acquisition of data: Ali Jahansouz, Gholamreza Hassanzadeh and Tahmineh Mokhtari. Analysis and interpretation of data: Tahmineh Mokhtari. Drafting of the manuscript: Abolfazl Bagherifard, Mahmoud Jabalameli, Hosein Ali Hadi, Mohammad Rahbar, Ali Jahansouz and Gholamreza Hassanzadeh. Critical revision of the manuscript for important intellectual content: Abolfazl Bagherifard, Mahmoud Jabalameli, Hosein Ali Hadi, Mohammad Rahbar, Ali Jahansouz, Gholamreza Hassanzadeh and Tahmineh Mokhtari. Study supervision: Abolfazl Bagherifard and Mahmoud Jabalameli. Financial Disclosure: This study was performed at the Bone and Joint Reconstruction Research Center, Shafa Orthopedic Hospital, Iran University of Medical Sciences, Tehran IR Iran.